Imagine my wonder and amazement when I turned on my computer today and read on Google's front page: "New! What’s that smell? 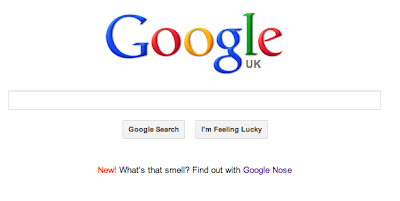 Find out with Google Nose." Your internet sommelier: Expertly curated Knowledge Panels pair images, descriptions and aromas. 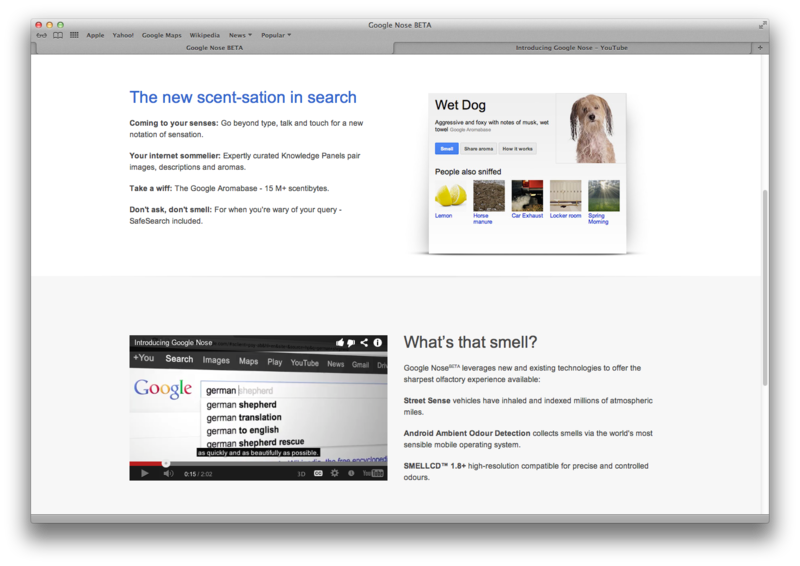 Take a wiff: The Google Aromabase - 15 M+ scentibytes. Android Ambient Odour Detection collects smells via the world's most sensible mobile operating system. SMELLCD™ 1.8+ high-resolution compatible for precise and controlled odours. 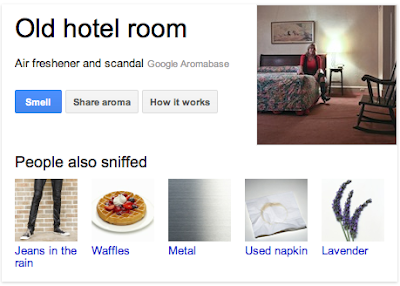 Clicking the link leads me to the "Google Aromabase", with a variety of captioned thumbnails. A tap on "Unattended Litter Box" reveals the description: "Distinct bouquet of ammonia with an earthy undertone". A smack on "Hot Springs" flashes "Boisterous bursts of sulfur with a hint of pencil lead on the nose". "Permanent Marker"? "Rubbing alcohol poured into a puddle of gas". "Garlic Breath"? "Allyl methyl sulfide". The odd stab at waggishness includes "Cologne: Perfume with a hint of testosterone" and "Perfume: Cologne with a hint of estrogen". Kee-yuk. Some of the terms are so pungently evocative that my eager clicks on their thumbnails end only in disappointment. The skin-crawlingly intimate nooks'n'cranies smell of "Belly Button" is mystifyingly re-imagined as "An organic tweed cotton potato sack". And "Grandpa's Hat", which surely conjures decades of sweat, sebum, and Grecian Formula, gets a sanitizing makeover to "Strong coffee and the forest". In a hat? Just when I'm about to offer my consulting services to Google, I notice one last thumbnail: a picture of a whoopie cushion captioned "April Fools' Day". The description: "Immature and cheesy, with a quick, bright finish". Sounds about right. But Google, I'm still offering my services. Was this not a seasonal jest? Perhaps your post was too? Oh lord. Things are so confusing for a foolish Dandy around April time! Yes P. Dandy, a seasonal jest. As clarified for the less cognitively-fleet amongst us in my second-to-last paragraph. 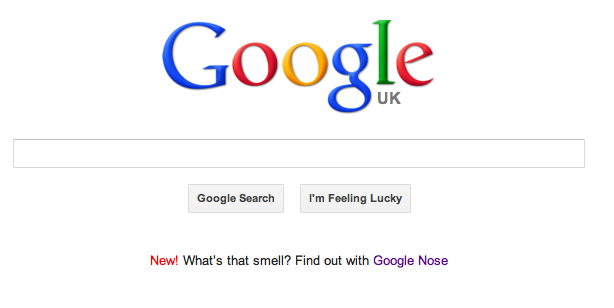 But I still maintain that Google Nose is a perfectly sensible and legitimate concept. I'm sure plenty of fumies saw it and harrumphed, "What's so April Fool-ish about that?" I think it's much better than "Electronics for cats" joke. Thank you for sharing: I was so busy yesterday that I've missed almost everything. Undina, I loved Google Nose's many "features" and wanted to get as much of it as I could down in the post for anyone who'd missed it. I'm pretty sure I could waste more time on a site like that than on Pinterest. I have been known to read and watch perfume reviews and descriptions for hours at a time anyway, so why not branch out to belly buttons and hotel rooms? I thought this was so funny and creative when I signed onto Google. So many of my friends fell for it. This can become a reality in the future one day---how cool would that be!? I have a Beta site that is wafting with far more sillage than Google Nosejob. Just had a hop, skip and sniff around your blog, JR. Very fragrant, for sure. Check it out, all! 1:36 - 1:40 is priceless. Had a good laugh with this.